"This recipe is outstanding and easy to make; a table pleaser for sure." Bring 4 quarts water to a boil in a large pot; add whole chicken to the boiling water. Crush half the ginger and add to the boiling water. Add crushed green onion white. Boil chicken until 3/4 cooked, about 10 minutes. Remove from pot and cool; reserve chicken broth. 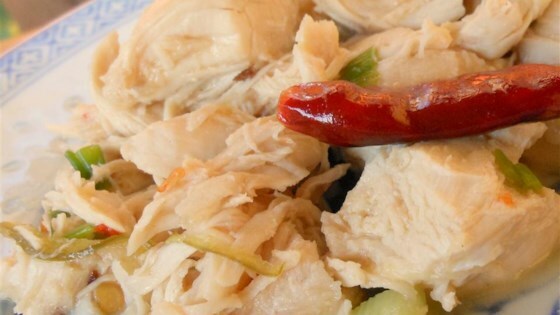 Remove skin from cooled chicken and cut meat from the bones. Cut meat into bite-sized pieces and set aside. Discard skin and bones. Peel the remaining half ginger piece and slice into 1 1/2-inch slivers. Combine ginger slivers, fresh red chile pepper slivers, dried red chile peppers, and red pepper flakes in a bowl. Heat a wok or large skillet over high heat; add lard and swirl around until melted. Cook and stir ginger-chile pepper mixture in the hot lard, continuously moving wok, until fragrant, about 30 seconds. Add chicken meat; splash cooking wine around the edges of the chicken. Pour in vinegar and season with salt. Pour about 1 cup (or more as needed) leftover chicken broth into the chicken mixture; bring to a boil. Reduce heat and simmer until chicken is no longer pink in the center and liquid is mostly evaporated, 5 to 10 minutes. Whisk cornstarch and 1/4 cup cold water together in a small bowl. Stir cornstarch mixture into chicken mixture; stir to coat chicken. Add 5 green onions and stir to combine. Remove from heat and stir in sesame oil. Discover a healthier version of spicy orange chicken. I really expected more spice out of this recipe, it was surprising how mild it wound up being. I used chicken breast rather than a whole chicken. Wouldn't make again, but it wasn't bad.